By the age of 14, don Miguel Ruiz Jr. was an apprentice to his father, renowned author and speaker, Don Miguel Ruiz Sr., who authored the famous book, The Four Agreements, as well as his grandmother, Madre Sarita. As he translated Madre Sarita’s prayers, lectures and workshops from Spanish to English, he learned the content of her teachings in both languages, through the repetition and review required. His apprenticeship was over a period of 10 years. By applying the lessons he learned from his father and grandmother, don Miguel has spent the last several years learning to enjoy his own freedom while simultaneously achieving peace with all of creation. His ability to apply those teachings to the world gave him the desire to pass on those beliefs to others. After decades of training, Miguel Jr. was finally ready to share everything he had learned. Now, as a Nagual, he helps others to discover their own optimal physical and spiritual health, so they in turn may achieve their own personal freedom. An accomplished author, don Miguel has written several books, including, Living a Life of Awareness: Daily Meditations on the Toltec Path, The Five Levels of Attachment, don Miguel Ruiz’s Little Book of Wisdom and The Mastery of Self. 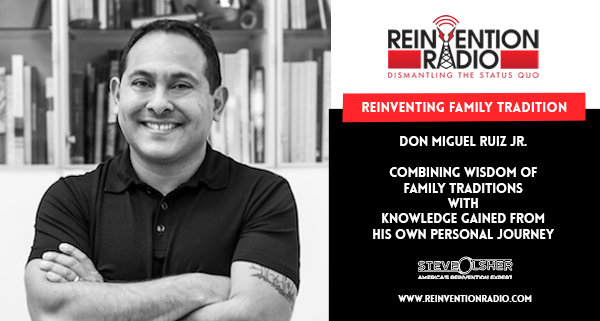 TUNE IN to this episode as Miguel chats with Steve, Mary and Richard about how combining his family traditions with the wealth of knowledge he gained from his own personal journey helps him to show others how to achieve their own personal freedom and optimal physical and spiritual health. Reinventing The Losses – In this episode, Brad Costanzo chats with Steve, Mary and Richard about how he teaches people how to have killer business conversations that are so good you’ll swear they’re “Wrapped in Bacon”.